Explore the Chianti Region with AESU! The Chianti region of Tuscany stretches 100 miles from the rolling hills of Florence to the citadel of Siena. The land boasts a picturesque Italian scene, as sunflower fields sway under the watch of rustic farmhouses, medieval towers, and crumbling castles. When wanderlust dreamers envision an Italian wine tour, sommeliers agree that Chianti is the most romantic place to explore. Historically, the Chianti wine region began as a small area of land, including the towns of Radda, Castellina, and Gaiole. 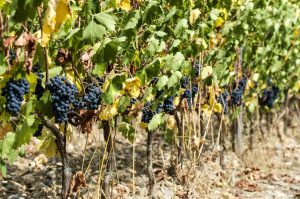 It has since stretched into a vast wine region, taking over provinces of Siena and Florence including Castelnuovo Berardenga, Poggibonsi, San Casciano Val di Pesa, Greve, and Barberino Val d’Elsa. These towns all represent the area of wine production known as Chianti Classico. Chianti wine is a red blend derived from Sangiovese grapes. A dry wine with notes of cherries, violets, tart red fruits, and pepper, Chianti pairs best with classic Italian dishes and charcuterie. The Montefioralle Winery is a small, family-owned operation known as one of the most welcoming hosts in the region. After a quick five minute tour of the cellars and the grounds, guests can enjoy generous pours of the family’s specialty wines. Enjoy between bites of thinly sliced prosciutto, crusty ciabatta, and garlic infused olive oil. Located in the heart of the Chianti region lies one of Tuscany’s oldest farming estates, Vignamaggio. When touring Vignamaggio, your guide will be extremely knowledgeable and fluent in several languages. He or she will take you through the cellars and around the breathtaking grounds of the vineyard. Sample the winery’s specialty wines paired with carefully selected cheeses and Italian meats. Opposite the intimate feel of the Montefioralle Winery, Marchesi Antinori is located on vast grounds outside of Villa Bordoni. The best way to experience a tasting at Antinori is to lunch at their restaurant, Rinuccio 1180. Located on top of the building and overlooking the sweeping hills of the vineyard, the restaurant provides the perfect scenery for sipping Chianti and eating pasta. Cheers! AESU offers several trips to Italy, including Cosmopolitan, Explorer, Euro Focus, Great Escape, Viva Italia, and Euro Spree. Explore Italy and its interesting culture, plus experience some of the greatest food and wine in Europe! If you have any questions or want help booking your Italy adventure, please contact AESU by calling 800-638-7640, or fill out the contact form found on our website. This entry was posted on Wednesday, May 24th, 2017	at 9:59 am	. You can follow any responses to this entry through the RSS 2.0	feed. Responses are currently closed, but you can trackback from your own site.